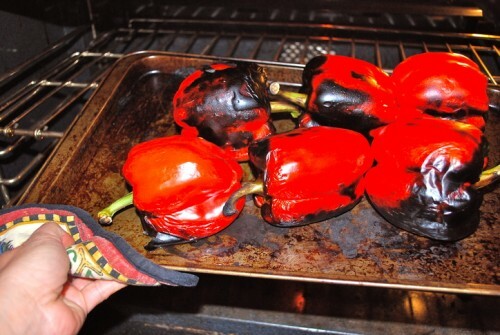 At any rate cows or not….these roasted red peppers are so delish! You can use them to top most anything….toasted garlic bread being my favorite! However if you are trying to keep your waistline down as I am then simply put them on top of roasted chicken or any grilled meat or eggplant or just about anything, or simply eat them alone. I sometimes do that too! It’s really hard….but I’m pretty sure you can do it! Are you ready? 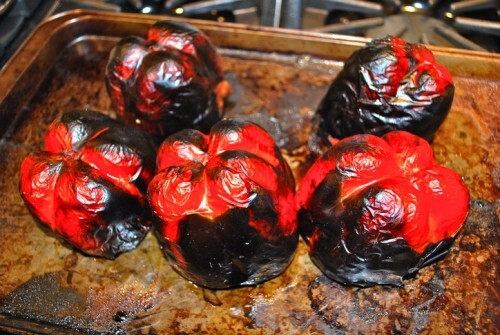 Ok here goes…….put them on a cookie sheet ( I always roast about 5 or 6) and then on the top rack of your oven and broil them until they are BLACK all over and I really mean all over. SUPER HARD RIGHT? Just keep pulling them in and out and turning them until they are black all the way around...obviously these are not ready yet. They are getting a little closer here, but not yet there. Peel the skin off…it will come off quite easily once they are cooled. 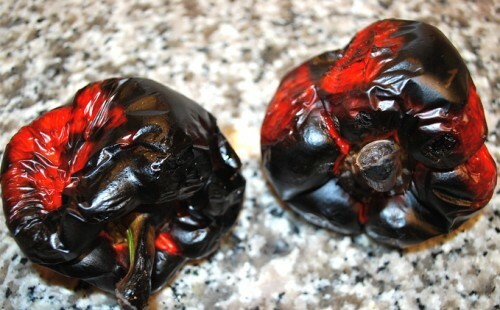 Be careful to hold them over a bowl while peeling because once you puncture them they will begin to drain their lovely oil/juice and you really want to keep as much of that as you can….especially if you are going the super lowfat recipe route. Now, if you want to do the low-fat version….I would suggest simply adding a little fresh crushed garlic and some salt and basil and call it good. 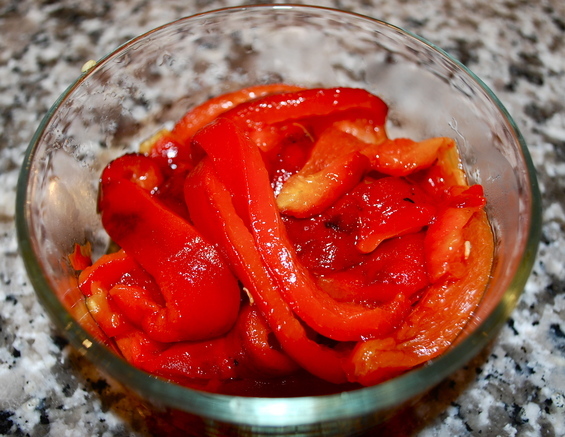 Peppers that are roasted have a wonderful natural oil/juice that is enhanced by the roasting method, and you really don’t even have to add any oil to them… Recipe below. 1 finely crushed garlic clove. That’s it! Let em sit a spell and absorb the spices and serve on chicken or whatever your little heart desires. NOW, if you want the decadent, ridiculously delicious, and more fattening recipe…. (not unhealthy mind you) because the oil used is olive oil and it’s good for you…it just has lots of calories, and well you know….However it is so yummy and if you only eat a little on a little tiny piece of little garlic bread and then don’t eat any more… until maybe about 10 minutes later… and then another about 5 minutes after that… and then another about 2 minutes after that… and then…..oh ummm…sorry I got a little carried away in my fantasy there! You get the drift right? THEY ARE SO GOOD! Using extra virgin olive oil....can someone explain to me how something can be "extra" virgin? I mean really! It's either virgin or it's not right? After they are all peeled and sliced add all the same ingredients as above to taste, and about 1/2 cup of extra virgin olive oil. That’s it…and of course let it marinade for a while before serving. This is a great addition to the first course of a great pasta dinner, maybe during the salad course….. 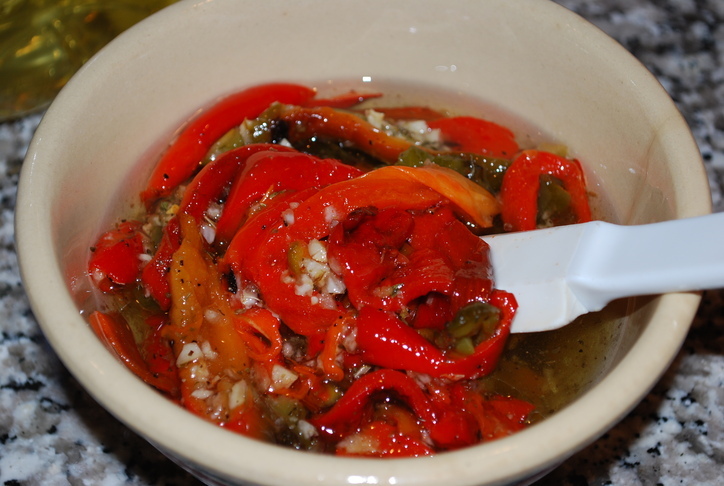 This entry was posted in Barbie's Life, Healthy Living, How to, Yummy Recipes and tagged crushed garlic, humor, Italian food, peppers, roasted, Roasted red peppers. Bookmark the permalink. ← How to Make Espresso the Italian way!